This area provides a space where students can share testimonials about their experiences on placements and internships. If you would like to contribute then please contact the group E3S-SESRG@e3sensory.eu. My name is Amanda Dupas, I was a Brazilian PhD student at the University of Padova when I had an Erasmus + Traineeship period at the Universidad Politécnica de Madrid (UPM) where I had the pleasure to work with Prof. Chaya’s team on sensometrics and consumer science, specifically about emotional response evoked by wines. During my time at UPM, I could learn about emotional response, personality evaluation, wine involvement scale, sensory analysis methods, consumer studies, and sensometrics. To tell the truth, the scientific results obtained during these 5 months were higher than expected. This period allowed me to be the last author of a paper entitled “A new index for predicting differences in repeatability of Time-Intensity curves: Time-Intensity Reliability Index (TI-RI)”, co-author of 3 abstracts at Pangborn (13th Pangborn Sensory Science Symposium) and 3 abstracts at AEPAS Conference (Asociación Española de Profesionales del Análisis Sensorial). I also could improve my teaching skills by giving seminars to undergraduate and postgraduate students, chefs and researchers. I could work with Spanish students from different regions of Spain, faced a new culture, and learnt a new language, which was very enriching for my personal development and professional career. Prof. Chaya has encouraged the team to continue working to gain deeper knowledge and she was always very generous, enthusiastic, and a strong woman of reference for the team. She also showed me different job opportunities in academic and non-academic fields, and I became member of the AEPAS and the E3S and E3S-SESRG. To sum up, I evaluate my experience at the UPM as very inspiring at professional and personal levels, and I strongly recommend students from other universities to experience a traineeship in Prof. Chaya’s group at the UPM. The UPM is easily accessible from the city center; Madrid is a such nice cosmopolitan capital with a vast cultural offer, delicious food and wine options to enjoy. Above: Mentor María Mora and Dr. Amanda Dupas during the Seminar entitled: “Introducción al Verjuice” at BCC. Below: Dr. Amanda Dupas and Prof. Chaya during the Verjuice consumer test carried out after the Seminar entitled “Reuse of thinned grapes to make verjuice: an innovative grape product” at UPM. “I am Giuditta Pagnozzi, an Italian Master’s student of the University of Milan, and I want to start telling that my mobility experience was one of the best choice I’ve ever made in my life. At the University of Milan I’m currently working supervised by Ella Pagliarini who inspired me in my university path; she motivated to take this decision, without her this experience would never happen. Thanks to Erasmus+ I had the chance to join the Universidad Politecnica de Madrid for 6 months, working with Carolina Chaya on my master research project, which was focused on Studying the Consumers Emotion in Beers Consuming. Working with Carolina and her staff opened me the possibility to meet an amazing group of people who helped me feel safe in a completely new place, taught me how to work in team and how to handle sensory topics that I’ve never approached before. Carolina enable me to have an active role in the whole process, making my mobility experience not only professionally interesting but also personally exciting and engaging. “To complete my master degree in Physiology of perception and Sensory evaluation, I had the great opportunity to undertake a six month internship (from march to august 2012) in the Technical University of Madrid under the supervision of Carolina Chaya. The aim was to test a Spanish lexicon to describe consumer emotional response and highlight two methodological aspects: the importance of using a warm-up sample and the effect of consumption context evocation. 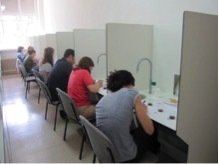 Evaluation sessions took place at the facilities of the Technical University of Madrid (cf. photo). The research allowed me to be co-author of a poster at Eurosense 2014 and a first draft paper. My supervisor Carolina Chaya always took the time to answer my questions, supported me and valued my work. “From July to November 2014 I had the great opportunity to undertake a research traineeship in the University Of Nottingham. The topic was in line with my previous research: emotional response to beer consumption. A year earlier, in Spain, I studied consumer emotional response to commercial beers using two different vocabularies, the EsSense Profile and a consumer-led lexicon. During this placement, I kept developing the methodology used and studied the effect of including an evoked scenario on the emotional response. Part of my research will be presented as an oral communication at the I Conference of AEPAS (Asociación Española de Profesionales del Análisis Sensorial) and I am now in the process of writing my first draft paper. I had always the support and guidance of my supervisor Joanne Hort and the facilities of the Sensory Science Centre (SSC) were fully equipped. The SSC is located in Sutton Bonington Campus, in the middle of the countryside and 30 minutes ride from the centre of Nottingham. However, there is a free coach service for students that covers the route from University Park (Nottingham) to Sutton Bonington. Nottingham is a city in the East Midlands of England where rules a university atmosphere and offers different leisure options. Research: Perceptions of student cafeteria meals among foreign students in Helsinki, Finland. “During my Erasmus experience, I had the chance to do my bachelor thesis with the Department of Food and Environmental Sciences under the supervision of Hely Tuorila and Laila Seppä. The aim of this study was to establish the food acceptance of the international students living in Helsinki, Finland. 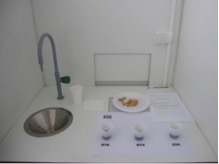 In addition, to describe the participants in terms of food neophobia by the factor structure of the scale, responses to items were examined. Furthermore, a comparison between the multiple nationalities to examine if there was any difference among the groups was made. My supervisors were always available to answer questions and help me through all the process of data collection, data analysis and writing. University of Helsinki department of Food and Environmental Sciences is located in Viikki Campus easily accessible from the city center by bus (30 minutes). The facilities had everything needed to make all the necessary studies, whether in the laboratory or experimental. During my stay I could observe why University of Helsinki is one of the top 100 Universities in the World. 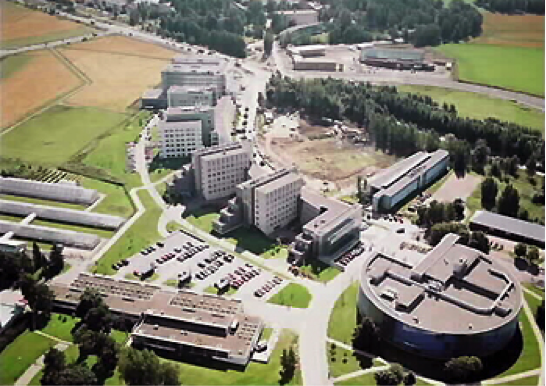 Complete view of Viiki Campus. “This year I had the great opportunity to spend one semester abroad at the Technical University of Madrid. From February to July I attended two courses at the university – one in English (English for Professional and Academic Communication) and one in Spanish (Sensory Analysis of Food). The latter taught by my supervisor Carolina Chaya. During the Sensory Analysis course we had many interesting lessons; for instance, a course about “Sensory Methods for Quality Control” taught by Joanne Hort from the University of Nottingham. Moreover, a fellow student from Germany (Michelle Liedtke) and I carried out a project on geographical indications. Precisely, we worked out two questionnaires (a German and a Spanish one) in which consumers were asked about the PDO, PGI and TSG seals in general, about products relating to these seals, about their buying behaviour and about their feelings towards the seals (WellSense Profile™). The questionnaires were answered online with the help of Unipark (a software to generate online surveys) in each country. After collecting all data from Germany and Spain, we made a statistical evaluation by using statgraphics® and XLStat and finished the project with a final report. Fortunately, we had the possibility to work in a sensory team with both students from the university in Madrid and international students. All of them working on a project with Carolina Chaya. Carolina always supported us in any case – no matter whether we had questions about the project or doubts about other daily difficulties. However, the other students from the sensory team helped us very much, especially concerning problems with the Spanish language. In addition, we could work at the “buhardilla” (a working room), available in Carolina’s Department for the students. There we had literature about sensory topics and enough space to work on our projects. During our creative breaks we spent some wonderful afternoons at the cafeteria with the team.